James Bianco of Orange, California has had his roots planted locally since birth. With roots that run as deep as the great oak tree in the heart of Orange – The Circle. This unlikely dancer would like the power of flight and loves brussel sprouts hash with bacon lardons. Now try saying that fast 5 times in a row without taking a breath! Good luck! James recalls first beginning dance in 1997, but mostly just intermittent encounters here and there. His official introduction to the dance world as a dancer wouldn’t come until a few years later in 2003. He was enticed by the excitement from the movie “Swingers”, as well as fun, high energy campaigns like a 1990’s Gap television add that featured swing dancers exuberantly tossing each other about through the air. This peaked his curiosity enough to sign up for sample ballroom dance classes which included East Coast Swing, Cha-Cha, American Tango, and Waltz. However, after ten weeks the classes were cancelled due to low enrollment, so along with the classes, James’ new dancing venture came to a halt for the next six years. To those who know him from dance, it might come as a surprise to hear that James never aspired to teach dance much less take classes. It took a two-for-one discount class coupon given to him by his mother, and his eager to dance little sister to convince him to give dance another try. James recalls being dragged (in his words) “kicking and screaming” to class by his sister, who needed a dance partner and insisted it be James. In reciprocity, later took East Coast Swing dance with James. James is one of those performers who was once painfully shy and gained confidence from dance. He remembers the feeling of having his social anxiety be eased by all of the friendly elderly participants in his classes who reminded him of comforting grandparent types. He finally began to have fun with dance and eventually broke down more of his walls by venturing into salsa dance. He also tried classes in American Tango, Rumba, Merengue, Cha-Cha, Bolero, Samba, Waltz, Viennese Waltz, Quickstep, Nightclub Two-step, Foxtrot, Hustle and West Coast Swing for the next year. After taking classes from Shesha and others for years, and helping with local events such as The Southland Strutters’ Ball, Orange County Lindy Exchange, Balboa Bash and more, James was invited to teach at ATOMIC. However, being the shy and reluctant dancer he was, it took some serious convincing since “being a dance teacher was not something I saw myself doing,” he explained. More than a year later he was persuaded to teach, in part by Shesha, and decided to use his new and unlikely passion for dance to inspire and help others. 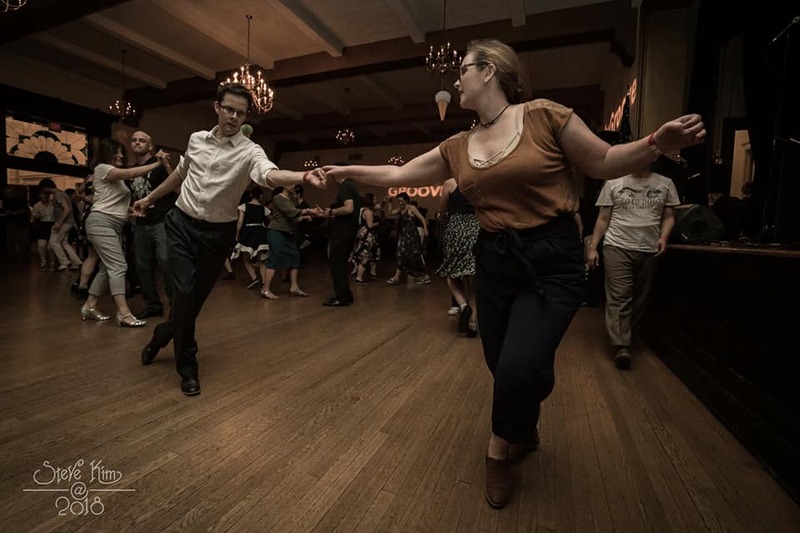 By this time, circa 2004, he put other non-swing classes on the back burner to focus on swing, and became a self proclaimed “LindyHop addict.” He also loves Argentine tango, but confesses to having enough on his plate with his specialties Lindy Hop, Balboa, Carolina Shag and Charleston. Favorite Dancers: Leon James was the first Lindy Hopper whose look and performance struck James; And overall favorites from any genre are The Nicholas Brothers. (Who James once met). Favorite music to dance to: Swing era jazz, particularly the music of Lionel Hampton. People would be surprised to discover: That James works for free, a lot. And that he genuinely never planned to become a dancer or instructor. In addition to teaching his regularly weekly group classes at ATOMIC, you can also find him on stage performing alongside fellow staff and students for the annual ATOMIC Showcase, showing September 22.